If you think you may have a carpenter ant infestation, contact us now to quickly get rid of the problem. Household sprays and killing individual ants does nothing to remove the problem, an experienced specialist is needed to destroy the nests and the queen. SK Pest provides carpenter ant removal services to homeowners throughout New Haven, Milford, Orange, Branford and the surrounding area. How can SK Pest help you remove carpenter ant infestations? Identify the species of carpenter ants causing the problem, to find the nests – both inside the structure as well as outside. SK Pest will take measures necessary to seek out and destroy all nest locations in and around the house, killing the queen which is the source of the problem. Carpenter ants are wood-destroying insects. There are eight carpenter ant species of different sizes and colors found throughout Connecticut. The most common and largest of these ants is the black carpenter ant (Camponotus pennsylvanius). Carpenter ants cause damage by excavating wood – burrowing into it to make room for their growing colony. While carpenter ants don’t cause as much structural damage as termites, if left untreated year after year, carpenter ant damage in your home can be extensive. Once a carpenter ant colony is established, they do not simply “go away.” You may not see foraging ants because their trailing habits change as their season progresses and the temperature and food availability may allow for external foraging, but once a colony is established, it will continue to expand as long as food and moisture are present – and, for ants, once they are inside a home, those items are easy to find. The only long-term solution to a carpenter ant infestation problem is removing or destroying the nest. When and where are carpenter ants active? 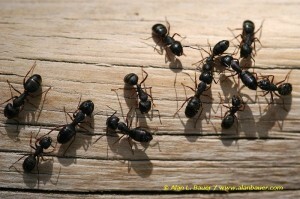 In Connecticut carpenter ants become active in May and slow down in October with July as the month of peak activity. If carpenter ants emerge during the winter or early spring, an interior nest is likely. Otherwise, during peak season, the ants may only be scouts from an outside nest. Homes built in wooded areas are prime targets for carpenter ant infestations. Carpenter ants are found in most urban shade trees and they can forage up to 100 yards to search for food – that can include a home that offers food and moisture. These foraging worker ants often establish satellite colonies apart from the parent colony around or inside a home. Homeowners should not only monitor the inside of their house for carpenter ant activity, but also the surrounding trees and other wood sources around the house to keep track of potential problems. The outside trees are their natural habitat so the objective isn’t as much to get them off your property, it is to keep them out of your home. How can you identify carpenter ants? Carpenter ants are exceptionally large ants with a uniform dull back color. The worker ants can range in size up to a half-inch. Like all insects, carpenter ants have six legs and three body segments, a head, trunk (thorax), and abdomen. Their trunk is “hunchback”-shaped when viewed from the side. Its body is covered with a tough, shell-like exoskeleton. All six legs are connected to the trunk. The antennae, or feelers, are used for communication, smell, touch, and taste. Carpenter ants have strong jaws with pincers enabling them to chew on wood. The larger workers can deliver a nasty bite, but unlike other types of ants such as fire ants, they don’t carry a poison sack and stinger. What’s the difference between winged carpenter ants and winged termites? Damage repair due to carpenter ants includes removing moisture damage by providing proper ventilation, installing effective vapor barriers, and repair broken or leaky pipes and gutters, replacing seriously damaged wood, caulking or sealing all potential entry points, trimming away vegetation that is surrounding the house including tree branches, shrubs, and vines, removing buried wood such as tree stumps. Grinding stumps isn’t enough. If the wood is not removed, you are giving the ants a perfect nesting environment. If you suspect a carpenter ant infestation in your home, call the pest control specialists at SK Pest. They’ll inspect the problem at hand and provide you with long-term solutions. SK Pest proudly serves homeowners in New Haven, Milford, Orange, Branford and the surrounding area.